We come from a heritage that is rich with hymns and chants. Young and old, urban and rural, all Hindus delightfully recite many of their favourite hymns. Hanuman Chalisa, without a doubt, is one of the most popular, more endearing ones. Gifted to us by the compassionate Saint Tulsidas, Hanuman Chalisa stands in a league of its own – powerful, vigorous and melodious all at once. Innumerable are the benefits of this powerful hymn, deeply revered and sung by all seekers. Negativities within and without are pounded into nothing; energy and enthusiasm soar in the invocation of the one who is unsurpassed in both; devotion and humility. After all, Shri Hanuman is hailed as one of the greatest devotees of the Lord. 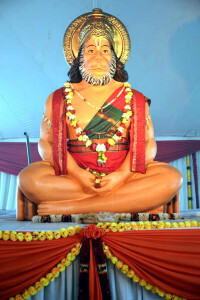 The Cosmic 108 Hanuman Chalisa Chanting and Havan has become one of the biggest and most successful events for the Hindu community in Durban. Conducted annually since 2012 at Curries Fountain stadium grounds, the event is attended by huge gathering of over 3500 devotees. Elaborate arrangements are made for chanting Hanuman Chalisa 108 times; and 108 special Havan kunds are setup to offer oblations. The program commences with the chanting of Ganapati Atharvashirsha, Navagraha and Shri Hanuman’s pooja. Swami Abhedananda chants the first Hanuman Chalisa to please the Lord with his devotional voice and set the vibrant mood for everyone to join in. From 7 AM in the morning until late in the evening, the atmosphere at the stadium is spiritually charged with the reverberating chanting of the Shri Hanuman Chalisa by the various musical artists together with the crowd. The 108 Havan kunds at the venue offer once in a lifetime opportunity to many to become Yajamans for such an auspicious event. The fires generated by the havan purify central Durban and its surrounding areas. Swamiji addresses the audience and speaks about Shri Hanuman’s many qualities as a devotee; and how we can & we must strive to emulate Shri Hanumanji in our lives. The full day event is telecasted live by South Africa’s popular Radio Hindvani. Pujya Swamiji has lovingly released and distributed beautiful souvenir books in the past years like ‘Samarpanam’ based on the glories of Shri Ram and ‘Chinmaya Shivam’ based on the glories of Lord Shiva, and ‘Unto Him Our Best’ as an offering to the Birth Centenary Celebrations of Pujya Gurudev. In the event, delicious lunch prasad is lovingly served to all attendees. Refreshment stalls with fruits etc. are provided for those who observe fasts. Gifts and mementos are presented to the priests and musical artists to express gratitude for their contribution. 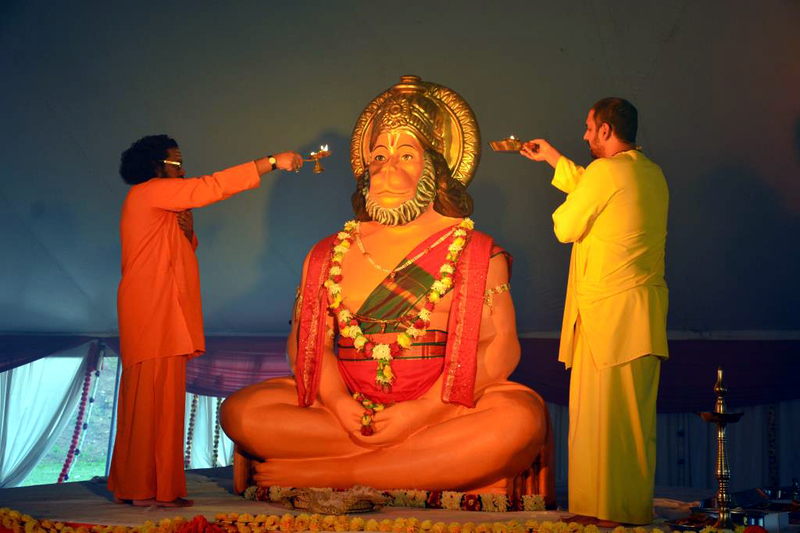 The sublime weather, a magnanimous 2.1 m tall idol of Shri Hanuman, continuous chanting with ardent devotion and the divine presence of Swami Abhedananda – beautiful combination of all these have always left the attendees satiated and feeling closer to God. 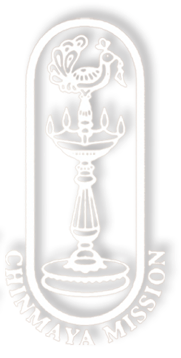 The Chinmaya Mission South Africa is honoured to serve the community by hosting these grand events and to bring the message of the Hanuman Chalisa to many. The Mission members feel indebted to Pujya Gurudev for giving such an inspiring platform to practice goodness and evolve further. Prayers gain depth and intensity, when they are said with devotion by many hearts together. Our faith in God alone lifts, inspires, changes and liberates! With the Grace of Shri Hanuman and guidance of Swami Abhedananda, we pray that the Mission should be able to serve the people for many decades to come. Shri Hanuman is the very personification of faith. His life shows that faith can move mountains and cross oceans. When a person lends himself to the divine will, with firm faith and overflowing love in his heart, an insurmountable amount of energy is unleashed through his actions, speech and thoughts. Like Shri Hanuman, only those who possess the qualities of tapas and single-pointed loyalty, can become the mighty servants of the Lord.